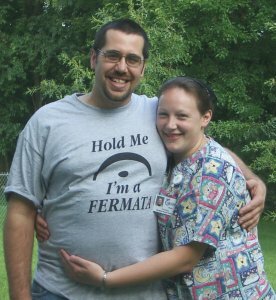 I stayed home from work today because of unforeseen (ha ha!) medical issues with my eye. I’m ok now, I’ll just be blind in my left eye for the rest of my life. Not really, it’s just inflammation and/or/maybe infection. After this dollars-per-drop medication, I’m sure I’ll be back to work tomorrow. I have some things on my heart that I wanted to share with you today, and my unfortunate and financially disheartening medical condition is affording this opportunity. Perhaps some lasting good will come of it after all. But don’t take this moment for granted, it has been paid for at great price. Physical, psychological, emotional, and last but certainly not least, financial. And paid for by me. So in the spirit of all the unseemly depths I’ve been finding in the various corners of the web, let us proceed. Hoosierville remains a never-ending source of amusement. I have two terms today, “topper” and “stones.” This is the kind of stuff you’ll hear in these parts, so I’ll translate. 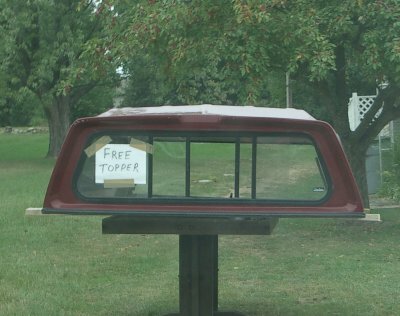 Occasionally, in the context of a conversation about pickups, you’ll hear “topper.” You grin at the absurdity and wonder, is that the name of the pickup owner’s dog? Or did he get a new hat? 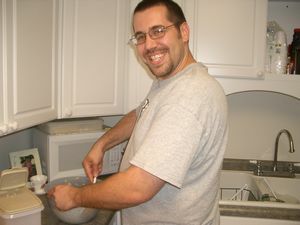 Is he a redneck and talking about making an ice cream sundae? No! What he means is “canopy!” Ha ha!! As proof, check this out! This was taken just down the street in my neighborhood, somebody has a canopy they want to get rid of. Next, “stones.” You’ll never hear the term “gravel,” I doubt anyone would know what it was. “He spread the stones in the parking lot,” is a common mirth-inducing phrase. What in the world! Stones?! Sounds like they expect you to park in a field strewn with boulders! Ha ha! How eccentric and naive!! This is a nice, funny place to live. Constant amusement everywhere. Check. There goes another item off my ITF list of things to do. Long-time constituents will no doubt recall when I first posted my answering machine message. It’s time to update. Being married and all, now I’m not the only one in the house. And seeing the way that ITF has taken off, I of course needed to mention it in case a loyal constituent was calling. Please take a listen to the new ITF answering machine message (0:09, 101KB). 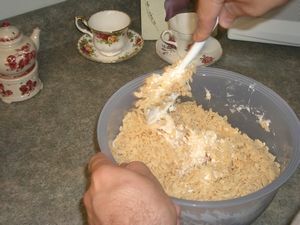 Here is one of my most famous recipes. I developed and refined it early in my culinary career, and it has proven time and again to be astoundingly popular. 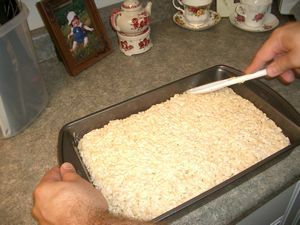 Rice Krispy Bars are easy to make and wonderful to eat, everybody likes them. I made them one time for my wife to take to a slumber party (before we were married), and all the girls were impressed and in awe. What you need: 1 bag (16 oz.) marshmallows, half-stick butter, rice krispies cereal, chocolate chips (optional). 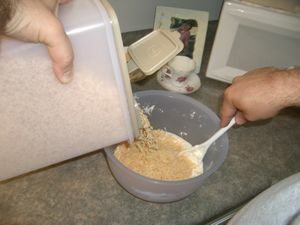 You’ll also need a 9×13 pan, large bowl, and mixing spoon. Make sure your bowl will fit into the microwave. We have a small microwave, so that got me once. 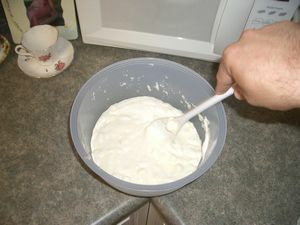 Put the butter in the bowl and zap it for a few seconds to soften. 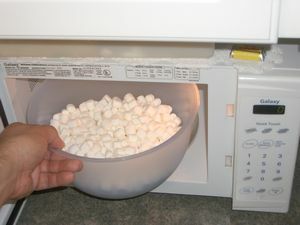 Dump in bag of marshmallows and nuke for 1 minute. Stir. Nuke for another minute. Stir again. That’s enough nuking! It should be nice and creamy by now. 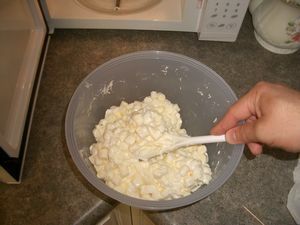 Dump in some rice krispies. 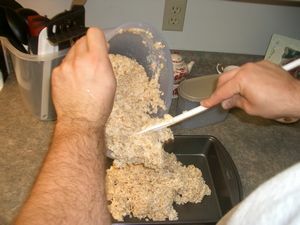 Dump in some more rice krispies. Probably dump in another shake or two of krispies. You can tell when you’ve reached the right amount, just listen to your heart. Stir until mixed well. 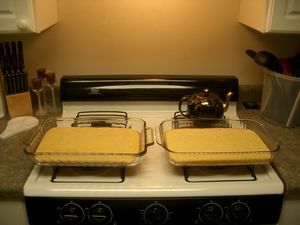 but this time both of mine were full of cornbread. 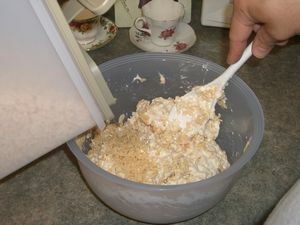 Dump half of the mixture into the pan. Poke down with mixing spoon. Sprinkle chocolate chips into pan. 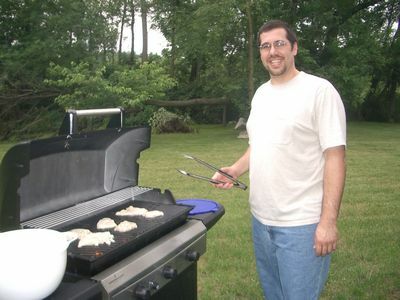 Re: the red arrow, you KNOW this guy has got to be a good cook! Note: it might be a good idea to sprinkle only half the pan with chocolate chips. My research showed that generally about 50% of test subjects liked the chocolate chips, the other half didn’t care for them. So putting them in half the pan is a good compromise. For the record, I (ITF Editor) love them. 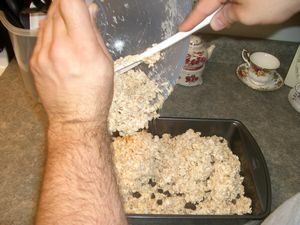 For a different twist on the chocolate chips, put them in during the final stages of stirring the marshmallow/rice krispy mix. 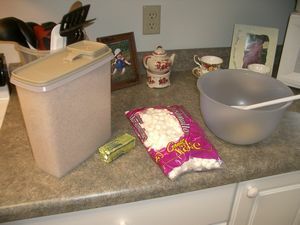 The warm melted marshmallows will cause the chips to melt also, and turn the whole mixture to chocolate! 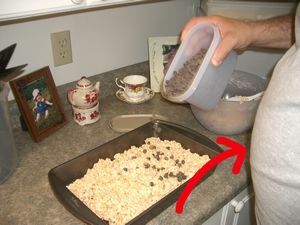 Dump the remaining mixture in over the chocolate chips. 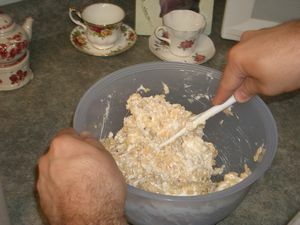 Flatten and spread with mixing spoon. You can also press down with wax paper, but I prefer the spoon method. Let the pan sit for awhile to solidify. If you’re in a hurry for a taste (like we usually are here at ITF headquarters), you can put them in the refridgerator for a few minutes. 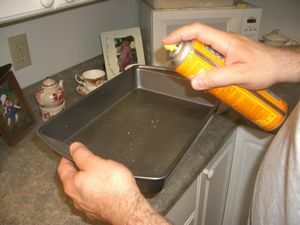 If you’re REALLY in a hurry (like we sometimes are here at ITF), you can put the pan in the freezer! Make sure to leave it in no longer than ten minutes or so, or it will start to get frozen-like. So there it is, ITF’s official suggestion for the perfect anytime snack! 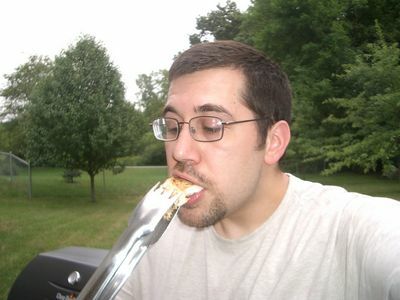 Here’s a preview of the upcoming post on the official ITF barbecued chicken recipe. Hopefully I’ll get it up in the next several weeks. 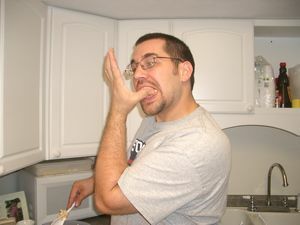 Here I am demonstrating my patented method of determining when the meat is done! Right now I’m under the influence of Valium. I’m quite disappointed, actually. I just went to a new dentist recently (I have a boatload of dental work to be done), and I demanded some type of sedation dentistry. I despise, abhor, dread going to the dentist. And in this day and age there’s no reason to put up with the horrors and trauma of it all, I want my mind altered when I’m subject to his tortures. So I had my exam and x-rays, and he gave me a prescription for Valium. I followed the directions and took one last night, with great expectations I might add. What a disappointment. Nothing much happened. I got a little tired, wasn’t quite as steady on my feet as normal, maybe. I thought, oh boy, this ain’t gonna do much for me when I’m in the chair. Today I was supposed to take one more pill an hour before my appointment. Forget that. I took two. Still didn’t do anything! I might have been a little more talkative, maybe more cocky, but my step was sure and my gaze was steady. Goodness. I want to be transported to another world. So I told them that this lame Valium didn’t do a whole lot (he wasn’t impressed that I took two), so he broke down and gave me a prescription for something stronger. He said people respond to it differently, but he’s seen guys my size have to be literally carried in and carried out after taking it. This is my new shirt. It was part of a wedding gift package designed to make me irresistible to my wife. Seems to be working, don’t you think?! Thanks Ag! My buddy and best man By has a solo on it, and absolutely kicks behind. My goodness. The Den of Iniquity remains a substantial trial. Many things unpleasant, yet at the same time it is in a number of ways the best job I’ve had. And a blessing of the new plant I’m in, no more radio! There are a few scattered around, but I’m not forced to listen to them like I was before. But I did hear that golden rule song that I like today. A few days ago one of the engineers came over and asked if I could come with him for a minute. Sure, I said, so he took me to a unit I had already finished. He pointed out an area on the unit I was responsible for and started telling me how a quality inspector was throwing a fit about it. I surveyed the area and immediately became alarmed. “This is really shoddy workmanship,” he told me. And it was. I quickly and articulately explained to him in no uncertain terms that I had not left it that way. Someone had unscrewed a wire clamp and pulled a foot more 10-2 110 wire and heavy conduit out of the floor, leaving it unsecured and sticking straight up. The clamp and screw were even still hanging on the conduit, waving in the breeze. We went and looked at the next unit and he said, “Oh, this looks very good.” He quickly realized that my quality workmanship had been sabotaged, and sheepishly let me off the hook.